Although John Clark has spent almost four decades in the concrete business, he is no longer knee-deep in cement. These days, you can find him demolishing an old floor inside a building, removing a foundation, completing a landscaping project, constructing a retaining wall or installing a drainage system. 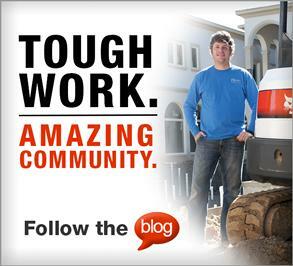 “When our concrete work slowed down for a time, we wondered what else we could do. Luckily for us, we had the type of equipment that allowed us to take our company in other directions. I learned quickly that if you have Bobcat® equipment, you always have someplace to go to work,” says Clark, owner of Keystone Enterprises, Inc. Since 1976, Clark focused his business on concrete construction. That is, until about four years ago when things changed. Clark, who works with his son, Rob, saw an opportunity to do more a couple years later. 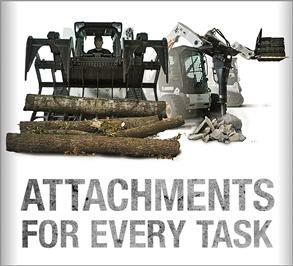 That’s when he added the T750 compact track loader, the E50 compact excavator and some more Bobcat attachments. While the M-Series E50 was a significant addition to the company’s excavating capabilities, the T750 was the first Bobcat loader owned by Keystone Enterprises. Plenty of features made the machine appealing — incredible power for pushing snow and carrying materials; 11 feet of vertical lift; and a spacious, comfortable cab with superior visibility. Clark’s aim is to stay small but continue to produce a high volume of work. The company owns an industrial grapple, 100-inch snow bucket, pallet forks and a hydraulic breaker for the loader, and a grading bucket, clamp, ripper and hydraulic breaker for the excavators. Clark’s son Rob is sold on the speed management function. Another benefit of speed management: lower fuel consumption. 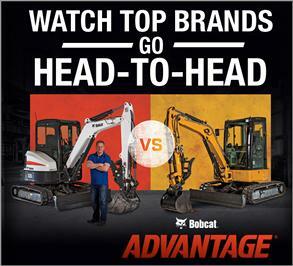 Both agree that the loader controls result in less operator fatigue at the end of the day. Regardless of the job, the SJC features make operating the loader almost effortless. Horsepower management. Improves efficiency by automatically matching engine torque to workload. Selectable control patterns. Perfect for jobs that involve multiple operators using the same machine, SJC enables operators to alternate between SO or H-pattern hand controls with the flip of a switch. Speed management. Allows the operator to adjust the maximum travel speed at full stroke of the joystick, dialing in a slower travel speed to match the job demands and have more precise control of travel speed throughout the joystick range. Driver response mode. Gives the operator a choice among three different settings for drive response to joystick movements. Choose a higher mode for a quicker drive response, or a lower mode for slow and smooth operation. Steering drift compensation. This feature helps keep the loader on a straight path when using side-shift attachments, such as a planer or trencher, that tend to pull the loader to one side.